For so long, Irish whiskey was resigned to a spot on the back bar, pulled off the shelf on rare occasions and often only then for the old man at your bar who drank nothing else. But that doesn’t give this spirit its proper due. Spicy and fruity, Bushmills Black Bush gives you a lot of scope for creating cocktails. It has a distinctive nuttiness and roundness on the palate, which benefits from the whiskey — a blend of grain whiskey and fine single malt — being aged in sherry casks, resulting in a gentle sweetness and a versatility that sees it being used in an exciting array of cocktails. Put simply: Black Bush ain’t your old man’s whiskey. Hand has three recipes that demonstrate just how versatile Black Bush is and show just how far you can push the envelope with this exciting spirit. Her classic with a twist, a Bushmills Old Fashioned, highlights the sherry cask character of Black Bush, a note which Hand says makes Black Bush fun to work with. 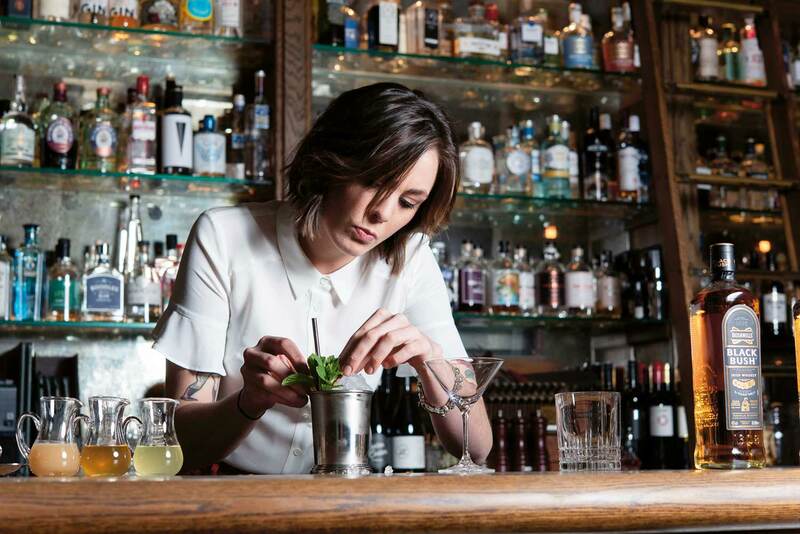 “It’s really versatile because of that little bit of sweetness and that makes it perfect for classic cocktails,” she says. Black Bush also gives a lift to drinks that deliver on refreshment, with the Bushmills Smash from Hand drawing upon the apple and spice characters she finds in the whiskey. “It’s highlighting the honey in the Black Bush; that little touch of cinnamon brings out the spice in the whiskey, and the charred lemon really builds on that smoke character that’s just hiding in there,” says Hand. And Black Bush is the star in Hand’s sustainable recipe, one which draws upon the waste elements of other drinks (she makes her own falernum from these ingredients that would otherwise be thrown in the bin), and it’s all made possible by the palate length of Black Bush. “Black Bush has that sweetness, and that body, from the sherry cask finish — it’s honeyed, sherry deliciousness. It’s so full bodied, the length is absolutely amazing,” she says. Give these recipes a go, and then see where you can take Black Bush — wherever you go with it, you’ll enjoy the ride along the way. Muddle the mint leaves with the charred lemon wheels. Build remaining ingredients over ice in a julep cup. Garnish with mint and charred lemon. Shake all ingredients with ice, and strain into a cocktail glass. Combine Tart crust (kitchen waste from custard tart 300g), spent coffee (1 barspoon), spent cardamom & cinnamon (from OF & Smash), waste Citrus with peel, sliced (1kg), and 750g sugar. Stir down all ingredients with ice in a mixing glass. Strain over block ice in an Old Fashioned glass, garnish with a lemon peel.